With 60 unspoiled islands tucked away in the Atlantic Ocean, the British Virgin Islands provide a bout of luxury with a Caribbean feel. There’s no better way to get some much needed rest and relaxation with blue skies, aquamarine water, and the highest quality of beaches, even by Caribbean standards; kick your feet up in the British Virgin Islands and finally destress. A popular sailing destination, many of the visitors to the island arrive by yachts, cruise ships and other sailing vessels so you’ll be amongst like-minded company. Snorkel, dive, and be pampered at world-class spas by day and attend full-moon parties and dance calypso at night. Fresh seafood is abundant so gorge on lobster and fish caught that morning while you can! Fly into the Beef Island Airport on Tortola. Before you meet the yacht, consider exploring Trellis Bay, which is home to a variety of bars, shops, local galleries and restaurants — it’s a wonderful introduction to island life in the BVI. Embark and set sail for White Bay, located on Guana Island. This quaint anchorage has quite a few snorkeling spots, although you cannot go ashore. In the evening, ask the crew to turn on the underwater lights to watch the tarpon feed. Cruise from White Bay, passing Great Camanoe, to Norman Island. An island steeped in tales of pirates and buried treasure, pit stop at The Caves at Treasure Point in Privateer Bay and swim into the mysterious caverns. The scenic lunch spots and incredible diving found off Pelican Island and the Indians are worth the one- or two-hour trip. Fishermen will delight in this location, which is very close to the South Drop, making reeling in the “big one” a very real possibility. Make way for Sprat Bay where you will find the Peter Island Yacht Club, perfect for a morning of pampering. Sun bathers can bask in the Caribbean sun on one of three beaches in the area. Visit Wreck of the Rhone, a mecca for divers if underwater adventure is your calling. Enjoy a Caribbean style dinner ashore at one of the island’s restaurants. 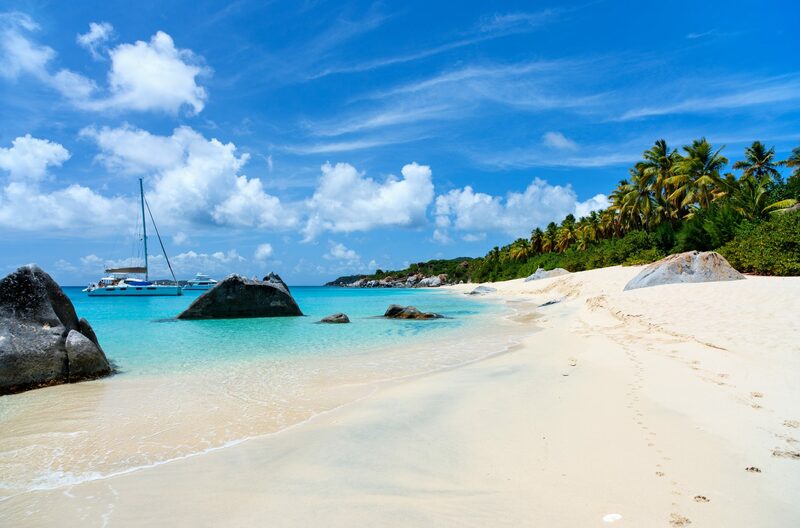 Virgin Gorda, though crassly named by Christopher Columbus for its dramatic shape, is anything but unrefined with its numerous yacht clubs, luxury resorts and splendid beaches. While on the island visit The Baths, a collection of boulders lapped by the sea presenting a unique geography. Make your way through The Baths to a local restaurant for lunch. Later, cruise to the North Sound, where you have the choice of three spectacular spots to stop, including Yacht Club Costa Smeralda, the Biras Creek Resort and Oil Nut Bay. All of these marinas offer luxury spas, restaurants and beautiful beachside clubs. Named for early settler and pirate Jost Van Dyke, this island is teaming with folklore and story worthy scenery. Upon arrival at Jost Van Dyke, choose between docking at the famed Foxy’s Taboo — one of the ultimate New Year’s Eve spots — or anchoring in Great Harbour. If the weather is placid, dive Mercurius Rock for stunning underwater views. In the evening, enjoy a last sunset alfresco dinner. Both Green Cay and Sandy Cay are perfect spots for beachside lunches. If you’re docked at Foxy’s, have the crew set up your farewell lunch ashore before you disembark.